Maranello, July 14th 2010 – The 458 Challenge has made its world premiere debut in Maranello during the Annual Dealer Meeting, a traditional event that brings together the representatives of Ferrari's international sales network. The direct injection 4497 cc V8 remains strictly in production tune, with an output of 570 hp at 9,000 rpm. That said, modifications have been made to the gear ratios and calibration of its dual-clutch F1 gearbox to guarantee higher torque at lower revs. The 458 Challenge is also equipped with the E-Diff electronic differential already employed on the road-going version, a first for Ferrari's track-only cars. Significant work has also gone into cutting the car's weight. This focused on both the exterior and interior with Ferrari's engineers concentrating in particular on reducing the thickness of the bodyshell panels and on using lightweight materials, such as carbon-fibre and Lexan. The new 458 Challenge also has a specific suspension set-up with solid aluminium bushings, stiffer springs, single-rate dampers, centre-nut 19" racing rims, larger dimension Pirelli slicks and a ride height lowered by 30mm all round. It is also equipped with the new generation Brembo CCM2 brakes which debuted on the 599XX, Ferrari's extreme experimental laboratory car, and which are integrated with an ABS system that features two configurations - low grip and high performance for dry surfaces. Another first for a Ferrari Challenge model is the adoption of the F1-Trac traction control system, the most sophisticated of its kind. Developed in-house by Ferrari, the F1-Trac system constantly monitors levels of grip for maximum high-performance road-holding. Two specific track-biased calibrations – wet and dry - have been developed for this application, with control logic and strategies derived from Ferrari's extensive racing experience in the F1 and GT championships. The F1-Trac is completely integrated with the E-Diff to guarantee maximum acceleration out of corners. The required ABS, F1-Trac and E-Diff calibration settings are selected via the manettino on thesteering wheel, the first time this solution has been adopted on a model developed for the Ferrari Challenge series. The driver can thus either chose from the WET or DRY configurations. In high grip conditions it is also possible to select CT-OFF to de-activate the F1-Trac traction control. 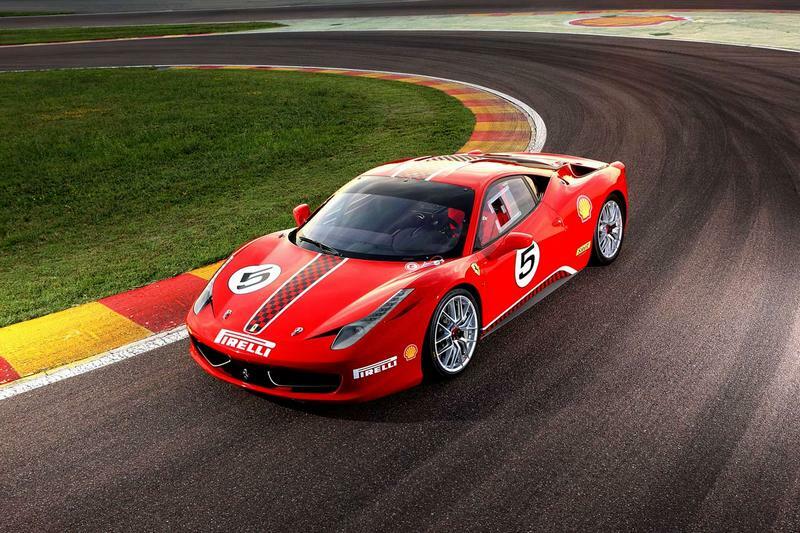 In the course of the intensive development sessions involved in honing the 458 Challenge for the track, the engineers also managed to improve the car's lap time at Fiorano by two seconds over that of its predecessor, resulting in a new record of just 1'16.5". Equally impressive is the amount of lateral grip the new car generates – up to 1.6G. With the new 458 Challenge, Ferrari is offering its sportier clients - professional and gentlemen drivers alike - a car that is extremely responsive, with great performance and superb handling. This mid-rear V8-engined berlinetta will allow Ferrari Challenge participants to enjoy to the full the exhilarating cut and thrust of the race weekends on the world's leading circuits, as well as the passion that has always been an integral part of Ferrari's one-make championship.